"Gentlemen, start your engines": Or not. 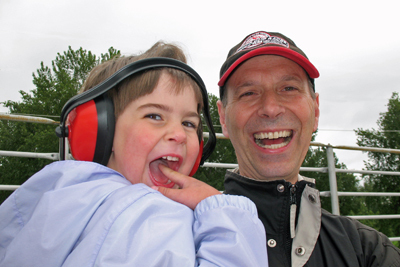 On May 28th, Jan drove to Portland with his racecar in tow to participate in the 2008 Rose Cup races. Unfortunately, on Friday the 30th, his clutch gave out during a practice run, and he was unable to complete the event. Nevertheless, Amy and Sofia drove to Portland to meet him, and the three of them enjoyed a busy weekend that included an afternoon and evening with the Williamsons (Sofia swam in their pool) and a fun half-day at the excellent Portland Children's Museum. Finally, with Jan's racecar gone for repair, Amy's car rode home in style without turning a tire—in the back of the race trailer! Jan's not in it, but he and Sofia (protecting her ears from the noise) still enjoy watching the Rose Cup. Speedy sixteen: For his milestone 16th birthday, Cameron celebrated with a car-themed party. First he and six friends went to K1 Speed in Redmond for two rounds of go-cart racing. Then everyone returned, and more friends showed up, for pizza, presents, and a cake with a '57 Chevy on it. Gifts included hubcaps for his Corolla, air fresheners, and a heart-embroidered steering wheel cover. The party lasted all evening, with some friends staying for pancakes the next morning. The most exciting part of being 16—besides being able to look down on Amy a full 5 inches—is that he will take his driving test in a week and a half! Spring break—in summer: In contrast to the rest of the family, Cameron enjoyed his spring break in 80-degree sunshine—on the ocean-caressed shores of Maui, Hawaii. Cameron spent 10 days with his dad, stepmother, and brother swimming, snorkeling, and boogie boarding right out the back door of their Napili condo. He returned home to an unusually cold and rainy Seattle, but he was relaxed and tanned. Spring break—in winter: In late March Sofia, Jan, and Amy flew to the Netherlands. The trip included an Easter celebration, lots of time visiting with family, and play time at the family-oriented resort Het Vennenbos. 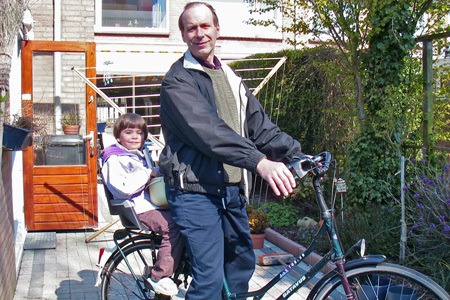 Amy stayed for one week; Jan and Sofia stayed an additional two weeks, during which Sofia attended morning preschool at Franciscusschool in Vlissingen. The winter-like weather was cold, wet, and windy and even included snow on the coldest Dutch Easter in 40 years! Sofia gained considerable confidence in and proficiency with her Dutch, and for that reason Jan considered the trip a great success. Little Women—and men: After six intense weeks of rehearsal (and dinner time upheaval for all family involved), Cameron debuted in the musical Little Women at Studio East Mainstage in Kirkland. He played John Brooke, Laurie Lawrence's tutor and Meg's eventual husband in four performances over two weekends in March. All family and friends who bought tickets reported enjoying Cameron's solid performance (although Cameron's two on-stage kisses did make Mom squirm), and the show proved well worth seeing.